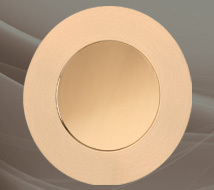 Saxton’s Golden Line Plates are individually spun from Solid Jewelers Bronze at our Glendale, CA facility. With a wide range of diameters, these Award Plates are perfect for any occasion including Record Sales Awards, Restaurant Achievement Awards, Food Industry Awards, Sports Awards and much more! Engraving available!